Your Beautique Training is proud to offer the most advanced and supportive training available. 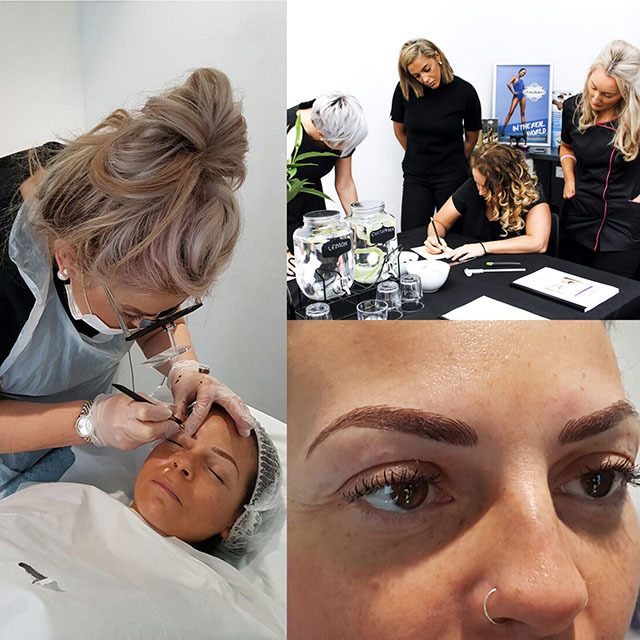 Microblading has taken the industry by storm and is such a fantastic career opportunity for everyone,for those wishing to add more aesthetics treatments to their current beauty skills or for those that are looking to start a new career in the beauty & aesthetics industry. This must have treatment will give fullness and definition to any brow & is in such high demand,with brow treatments being one of the most talked about beauty treatments all over the world. Learn now to become an elite technician,stand out from the rest and learn with some of the most experienced trainers in the UK. Our intensive 3 day training course will give you the technique and the knowledge to perform beautiful brow microblading treatments. We insist on small groups of 4- 6, in our luxury training suites giving maximum support to our students. Students will need to complete our online infection control for tattooing & beauty training course prior to starting your microblading course this should take no longer than 1 hour & is also included in the course price. Our course is approved and fully accredited by ABT (Associated Beauty Therapists) in UK. The 3 day course will consist of pre course home study and 3 practical days in the academy. Once you have completed your 2 days training at the academy you will be required to continue your study at home on practice latex where your tutors will further coach you online to perfect each stage of your brow pattern, preparing you to be able to work on your own clients confidently & creatively. You can reorder all your microblading products & equipment from our shop at the academy,or you may place a telephone order. Reserve your place online today with a small deposit. Now you are qualified and on your journey to become the best at what you do, do you feel you would benefit from that extra push,that extra bit of guidance or support in a particular element of your microblading treatment? Do you need additional tips on brow design, pigment colour choice or mastering nice crisp hair strokes,if you answer yes then this is a must for you? This workshop day training course is completely bespoke and tailored to your needs,so bring your models,(up to two), and we will be there to offer you that extra bit of training to get you moving to that next level and master those things that niggle you about your work. Have the chance to try out our brand new sterile disposable tools ,we know you will love them as much as we do! With a small group size of just 4 – 6 trainees and 2 tutors, this means that you’ll have plenty of hands on help & a great opportunity to ask questions and speak to fellow Your Beautique accredited artists too. 17-18 January , 18-19 March Reserve your place online today with a small deposit. Our courses have been structured from start to finish with you in mind, to ensure that when you complete your training, you will leave with the specialist skills that guarantee you will feel confident to perform microblading procedures. Your microblading tutors have over 8 years’ experience in the SPMU industry and over 25 years in the aesthetic industry, with a wealth of experience and expertise that they will pass onto you. Knowing that you have chosen with confidence the best training academy and you will gain a qualification that is renowned and acknowledged by your future clients,will give you the peace of mind you need. Our courses are of the highest quality, and satisfied students are proof of our professionalism and standards.